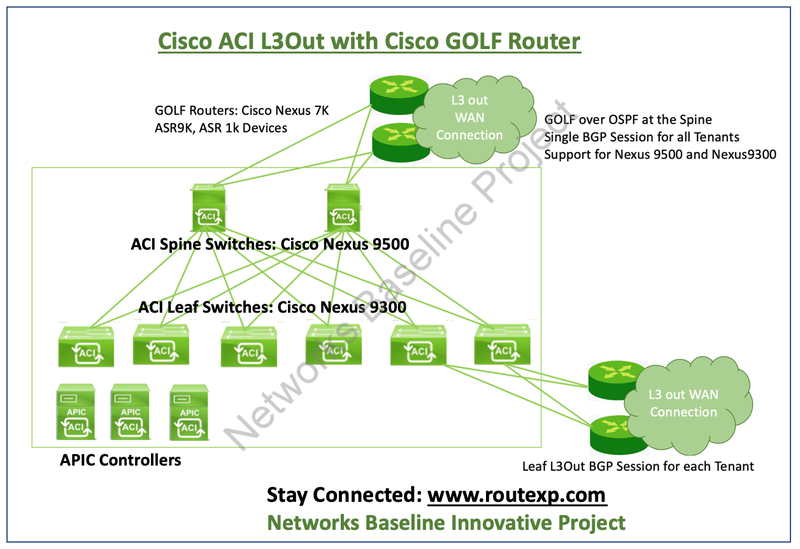 Today we are going to talk about the L3 out in Cisco ACI infrastructure called as Cisco ACI GOLF concept. In the Spine-Leaf architecture, the basic L3Out is from the edge leaf switches which Arista, Cisco and other vendors designing but Cisco came up with the other L3Out solution via the Spine switches and for this the L3Out devices are called as GOLF routers. The GOLF feature is there in Cisco ACI infrastructure. What is Cisco ACI GOLF feature? The Cisco ACI GOLF feature permits considerable extra resourceful and scalable ACI fabric WAN connectivity. It uses the BGP EVPN protocol over OSPF for WAN routers that are connected to spine switches. In the Cisco ACI GOLF design, all tenant WAN connections use a single session on the spine switches where the WAN routers are connected. This collection of tenants BGP sessions near the Data Center Interconnect Gateway (DCIG) advances control plane scale by cutting the quantity of tenants BGP sessions and the total of configuration needed for all of them. The network is stretched out using Layer 3 sub interfaces designed on spine fabric ports. Transit routing with shared services using GOLF is not supported. While designing GOLF on a spine switch, wait for the control plane to converge before configuring GOLF on another spine switch. A spine switch can be added to multiple provider GOLF outside networks (GOLF L3Outs), but the provider labels have to be different for each GOLF L3Out. The BGP EVPN session in the matching provider L3Out in the infra tenant advertises the tenant routes defined in this L3extOut. When you implement Layer 3 Outside (L3Out) networks to external routers, or multipod connections over an Inter-Pod Network (IPN), it is critical that the MTU is set suitably on both sides. On some platforms, such as ACI, Cisco NX-OS, and Cisco IOS, the configurable MTU value takes into version the IP headers (resulting in a max packet size to be set as 9216 bytes for ACI and 9000 for NX-OS and IOS). Though, other devices such as IOS-XR design the MTU value exclusive of packet headers (resulting in a max packet size of 8986 bytes).